Intrinsic motivation is an important predictor of academic success for young learners. Often, the motivation to learn and absorb knowledge with which we are born can be hindered when educators impose the same goals on all students in a classroom. Not only should every student be working towards goals that are tailored to his or her needs, background, strengths, and weaknesses, but students must also participate in the creation of their own learning goals in order for these goals to encourage the highest level of motivation on the part of the student that is possible. Additionally, educators must be sensitive to the different strengths and needs of their students in order to plan effectively. They need to begin their plans with appropriate goals for each student. For this reason, I decided to work with my students to create a culture of goal-setting to solidify their sense of intrinsic motivation to learn as well as to ensure that their learning would be tailored to their needs. I began a goal-setting program in 2015, the same year in which the Yeshiva Lab School, now the Kohelet Yeshiva Lab School, opened its doors. The school began with a vision to recreate Jewish Education in line with what research has told us about what children learn. A few of our major principles of learning included the importance of intrinsic reward, metacognition, and personalized learning. These principles inspired my attempt at creating a culture of goal-setting. I also felt that goal-setting was a life skill that would help my young students find success both in school and beyond. With the ability to set and achieve goals, they would be able to work towards their long-term dreams in organized, well-planned ways. At the time, I was teaching a group of seventeen kindergarten students, the founding class of the new school, in both religious and secular subjects. The brand new school and eager students provided fertile ground for a new academic culture. Students worked together towards a teacher-created goal and reflected on the steps they took to reach this goal. Students chose three goals from among a variety of educator-created goals towards which they would work over the coming month. They met with the educator to ensure that their goals were appropriate for their needs and abilities. They each created a plan with the educator to work towards their goals. The educator planned lessons in view of the goals set by the individual students and checked in with students regularly to check on their progress towards their goals. Each month,students created new goals with the educator; gradually, these goals became student-created. Students reflected on their goals throughout the academic year and worked with their parents at a student-led conference to create a goal towards which they would work in the summer. The starting point for this unit of study was Parshat Vayeitze. Every week, the educators in our classroom would explore the parsha to find meaningful lessons for students that would transfer to their other academic studies as well as their personal lives. The part of Yaakov’s story that seemed most relevant to me was his ability to work for so many year towards one goal: marrying Rachel. I felt that this lesson of persistence was a great way to introduce a culture of goal-setting that would encourage our students to reach their unique potential, experience the joy of intrinsic rewards, and raise the level of personalized learning that we as educators could accomplish. I began by introducing the word “goal” during our introductory lesson to that week’s parsha. I framed Yaakov’s toil in terms of reaching a goal. The following day, students were given a communal goal towards which I asked them to work together. Using recently arrived building materials, students were asked to build a playhouse inside which children could play. Students found that the task at hand was not as simple as it first appeared. They had to plan their attempt, restructure their plan when their first attempts failed, and build on their experience and the experiences of their peers to reach their goal. After the experience, I led the children in a reflective conversation to ensure that they understood that they had to be persistent, change tactics, and flexible in order to reach their goal. The next morning, we recalled our experience from the day before. As a group, we made goals for the entire class that would better our community. Our initial goals were simple and reflected the needs of a community of kindergarteners. For example, our first goal was to finish cleaning up after playing within the length of Elton John’s The Circle of Life. Our next lesson shifted our focus from communal to personal goals. This is when the most important work began. Prior to the lesson, I made a list of potential goals that were appropriate for our students. This way, I could have prepared goals in order to scaffold the goal-setting experience appropriately. My wonderful principal, Becky Troodler, helped to create images to represent that goals that I had imagined would be appropriate. We also each spent time searching for goal-setting templates in order to create one that worked best for our environment. 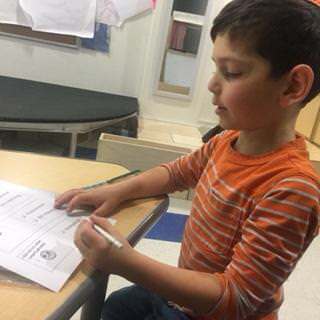 The template we created has been the basis for the goal-setting sheets that we still use at Kohelet Yeshiva Lab School today. The next morning, students met with me in small groups to choose three goals that they wanted to reach within the next month. Most students chose from the pre-set list of goals, while others worked with the teacher to create their own, realistic goals. The small group sizes allowed me to ensure that students chose goals that were challenging yet attainable. Working in small groups allowed me to converse with each student to make sure that his or her goals were appropriate for his or her strengths and areas for growth. The goals spanned a wide range of skills so that each student was able to find three pre-made goals to fit their needs. An example of a goal-setting worksheet can be found here. I was able to then use these goals to frame my lesson plans. Students would spend time working towards their individual goals in specific academic areas through both independent work and small group instruction. I repeated this process roughly every month through the end of the academic year. I would meet individually with students, and we would discuss their progress in relation to these goals. Twice during the year, we supplemented these meetings with an in-depth look at the child’s online portfolio showing all of the major work that she or he had completed. Then, we would create new goals or discuss new strategies to reach our old goals. Gradually, I took away the option of teacher-created goals, and students had to use their experience with goal-setting to create attainable and concrete goals for themselves. Reviewing old goals became an exciting event for both the students and for me. The students demonstrated immense pride and joy when they discovered that they had met the goals they had set. I had never seen such a clear example of the joy of intrinsic reward. I was also impressed with their approach to goals towards which they were still working. Rather than become discouraged, the students were willing to work with me to create a new plan to meet these goals. Through our goal-setting meetings, students became accustomed to thinking about their own progress and thinking critically about their learning process. This experience allowed them to successfully prepare for student-led conferences held at the end of the academic, during which the students led their parents in creating a goal towards which they would work over the summer. Despite the success of the goal-setting program, I felt that there were many ways in which I could have improved the program to better fit the needs of the students. First, I was bothered by the fact that I was the only person who had constant access to the students’ goals until they were uploaded to their portfolio towards the end of the academic year. Most significantly, this meant that students could not look back at their own goals as they strove to meet them. Their only opportunity to view their goals was during our private meetings or specific goal-setting lessons. In the future, I would like to develop a system by which students can access their set of goals at all times. I would also like to create a better system for displaying a student’s progress according to his or her goal-setting worksheets. Initially, completed goal-setting worksheets were stored in a child’s electronic portfolio with all other work from throughout the year. In order for this program to be most effective, examples of a child’s goals must be kept together in a logical sequence for each child to see a visual representation of his or her achievements. Additionally, the goal-setting template that I used did not have space for students to create a plan to meet their goals. While I believe that our template works for young students just beginning to learn about goals and just beginning to read, I do think that, by the end of the academic year, many students would be able to write out and read their plans independently. We are continuously developing our template to allow students to have access to their plans to meet their goals. What began as a simple parsha lesson has transformed the school culture of the Kohelet Yeshiva Lab School. Today, goal-setting permeates all parts of our day. Students set social-emotional goals, communal behavior goals, and academic goals. As our school has grown to over sixty students who have become more accustomed to goal-setting, our students have begun to set separate goals in each academic subject. They also continue to set communal goals as they develop a sense of communal responsibility. Perhaps most significantly, the process of creating a culture of goal-setting has transformed my work as an educator. While individualized learning has always been an important part of my teaching, I now have a starting point that honors each child’s vision for herself and simultaneously creates a system of intrinsic reward in my classroom. Now, when I find that a student is being pushed beyond her limits or not quite challenged enough, my first response is to create a goal with that child. Not only has creating a culture of goal-setting influenced the way my students approach learning and their metacognition, it has transformed our team of teachers to inspire more individualized learning responsive to our students’ sense of self. Please see an example of a child checking on his progress towards his goals from December in February and his new goals. Please see the progression of one student’s goals from December to March. Rachael Simon is a founding educator at the Kohelet Yeshiva Lab School, where she currently fills the role of General Studies Specialist in the Kindergarten/First Grade classroom. Rachael studied International Politics and Development at Georgetown University, where she focused her study on education in developing countries. Following graduation, Rachael earned a certificate of Teaching English as a Foreign Language and relocated to Rabat, Morocco, where she taught Kindergarten and First Grade at Maple Bear Canadian School as well as English Language at the American Center of Rabat. In Rabat, Rachael was trained in Early Childhood Education and became familiar with progressive forms of education. Rachael returned to the United States to teach at the Jewish Community Center of Northern Virginia, a Reggio Emilia-inspired school, in Fairfax, VA. Rachael was attracted to the Reggio Emilia approach because of its child-centered and project-based learning as well as its emphasis on the child’s interaction with her community. Eager to be part of a new project to transform Jewish education, Rachael relocated to Bala Cynwyd, PA to be part of the founding teaching team at the Yeshiva Lab School, now Kohelet Yeshiva Lab School, where she has been teaching for three years. Rachael will earn her Master’s in Jewish Education from Gratz College in May 2018.